Located in the heart of Colombo 10, the premises presents as an outstanding opportunity to secure an investment property in an excellent position. The shop is positioned in a prime commercial location of the rapidly growing Colombo Precinct, viewing the Lotus Tower which is the tallest structure in South Asia and the property is within close proximity to an array of major amenities and attractions which include hospitals, schools, shopping outlets, public transport nodes and a plethora of local restaurants and cafes. The retail premises built in 2007 and offers an ideal and rare opportunity to purchase a large format property, with a floor area of nearly 2000sqf* on a land extent of 7.82 perches with a higher value appreciation and higher rate of return. and the retail shop has an extensive well-designed fit out and offers exceptional street presence with about 25f of prominent frontage to Abeygunarathna Mawatha Deans road. Previously leased to CoopfeD Food city and currently occupied by a reputed company Sporting Star as seeing on the pictures. 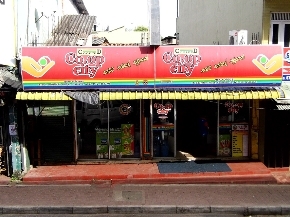 This premises is highly demand and ideal for any kind of business operation and the buyer can expect a rental income approx 2 Mn LKR per annum from the Ground floor only which is proposed for 02 stories and clear potential to make more profitable revenue by investing for construct another 02 stories which is already been approved by Colombo Municipality. Highest bidders are welcome to make offers. Sale price offers above 53 Mn LKR (fifty-three million) and Genuine buyers are encouraged and invited to make reasonable offers after inspection irrespective of the price quoted. Please don`t hesitate to call for further information or to arrange an inspection.